Well, by best intentions of yesterday to tidy up went sadly awry. Instead, I was consumed with sewing. I have the crumb blocks done and branched out to the Word Play. I had to give it a go and see if I could follow the instructions in the book and actually make something. I am determined to actually follow the Quilt as You Go concept for the whole thing so when I get done I only need to bind it. 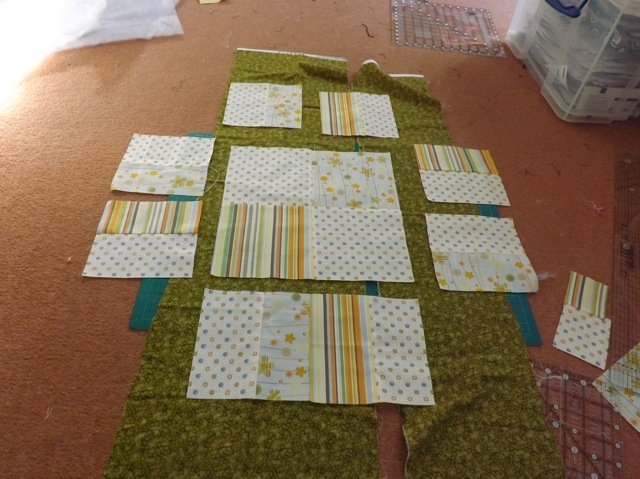 I did a sample piecing of a couple of blocks and so far (knock wood) it’s going well. Th thing that scares me is the machine quilting. I cannot manage the lovely closely packed scribbles that I’ve seen, so I’ve opted for a simple cross, with stitch-in-the-ditch around, then a seconde square around. I need to read up on dealing with the pulled-to-the-top bobbin threads, clearly. 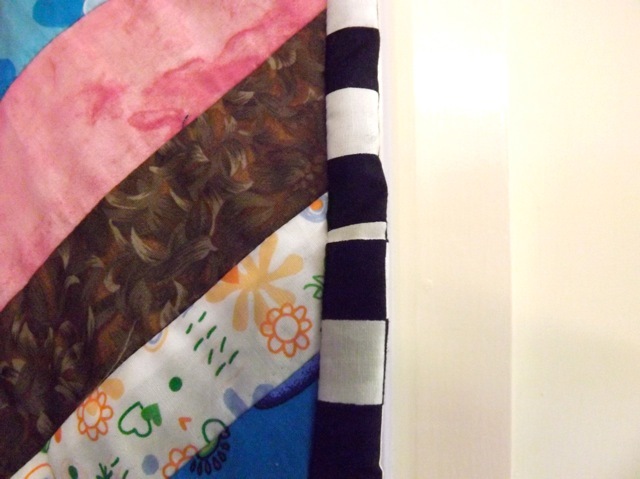 I’ve picked quite a bright stripe for the sashing on the front, and plain black on the back, as the backing fabric is a B&W cow print. And the word ties in with the smiley sunflowers that are at the heart of the crumbs. Now, off to Hobby Craft with some shreds of the floss colour to get a better match, and then I have an idea that I THINK will work to add a bit more colour and playfulness to that improv quilt. Need to get one small thing (although maybe not) to make it work. It is totally a not-a-quilter idea, and actually uses something I’ve used in my scrapbooks for YONKS. 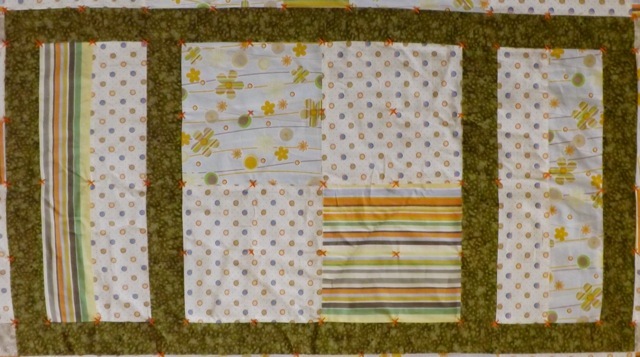 If it works I’ll share, and then all the real quilters can blanch and gasp and say Why, that’s crazy talk! But I am convinced I can make it happen so I have to persevere. It is my nature LOL! Oh and GRRRRR. Spam and Spammers. Hating them at the moment. 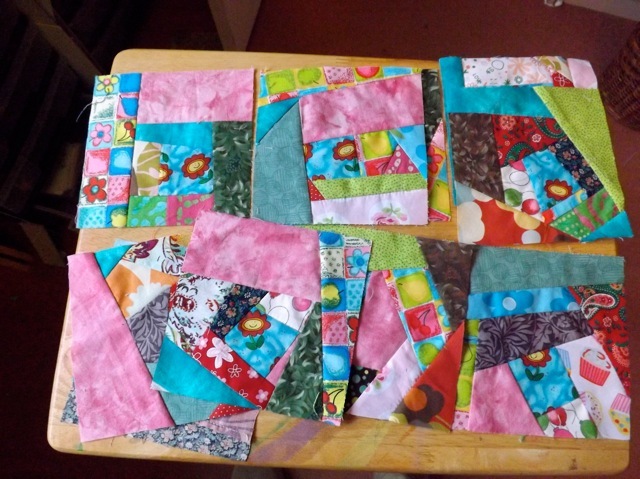 Hating them as mush as I am loving reading up on “liberated” quilting….. Everywhere I look it’s chaos. 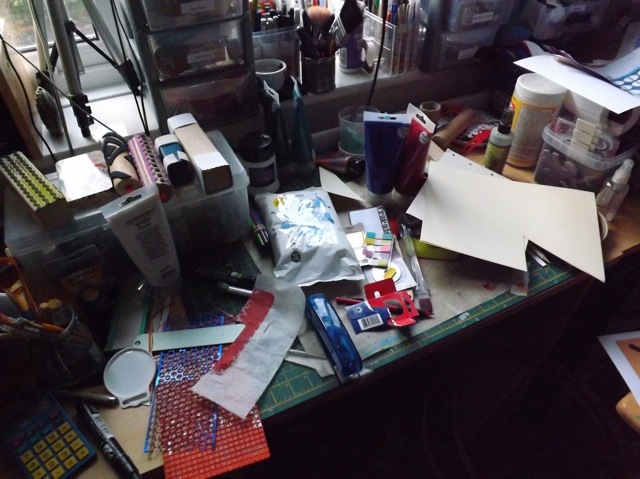 My desk…oh dear, my desk. It’s seen no attention for a week. 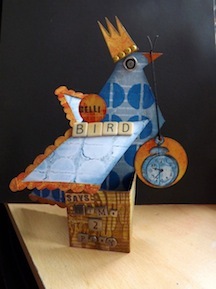 But I am determined to tidy up and start on my ATC…maybe ATCs, not sure yet, for the big WOYWW anniversary swap coming up. I have been sewing rather than papercrafting but I am stuck. I decided that the orange floss I bought is NOT a close enough match for what I have already used so it’s back to the store (stores?) to find a better one. But first, I HAVE to bring some order to the chaos! …and pop round to YOUR desk to see what you are up to! It’s been a bit manic around here, so I missed out 2 entire days of blogging. I hate that. Anyway, what I SHOULD have posted is the X-tied quilt, but a series of things got in the way – I bought some floss at a small local fabric store, and never realized it WASN’T DMC! I used the 2 skeins I had, and when I ran out, I stapled the band to my shopping list and trotted off to Hobby Craft to match it. Imagine my surprise when I found the colour in the bin was a dark GREY and not a bright ORANGE. I knew I had bought the last two skeins at the small store so I had to get something. Knowing that true colour memory is non-existent, I picked what I thought was the right shade and brought it home. 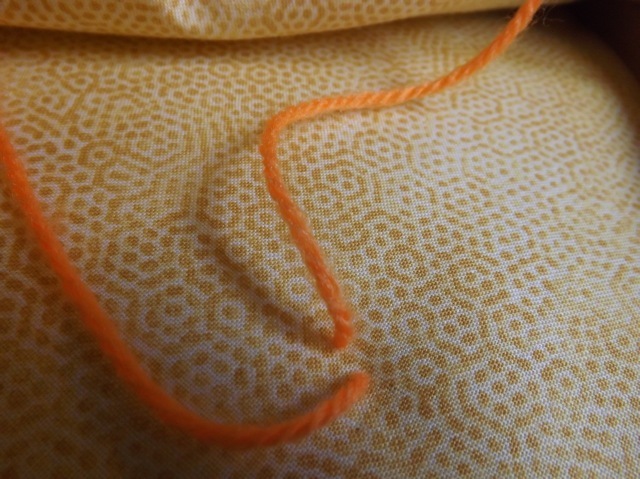 There I found the problem – I had a single skein of a DMC orange that was a bit too dark. The band had come off and was laying on my desk, and when I grabbed the band to staple it, I grabbed THAT one, and not the GOODWEAR brand (Huh?) that I had used. So I ended up with a CLOSE match but not a perfect one. DOH! So I will hope to finish the last few ties on that today, and bind it, and then I need to sort out labels and a bag of some kind. Then I can finally send it off to JoZarty. In the meantime, here is a shot of how it’s progressing. I think the X-ties bring just a bit more playfulness to it, as the fabric is less kiddie oriented than I would have picked. To be honest, I AM (rightly or wrongly) looking at this whole charity quilt experience as a nice way to try out some things that I have seen well in the past (and look at every time I get sidetracked from my love of paper into a temporary fixation on fabric) and to use either scraps I have or inexpensive fat quarters. I figure that ANYTHING is going to be welcome, as long as it doesn’t fall apart. so the fact this one is not made from overtly child-obvious material doesn’t mean it won’t still be cuddly and a comfort. It needs a good wash and dry to get rid of the hoop-creases and I can see a few of the Xs don’t quite line up – or maybe it was the distortion of the hoop that made me mis-place it but that is actually easily fixable. I am determined to finish this up today of I can! The weather is ARCTIC around here and with wind-chill it is well below freezing. Brrrr. And DH took my car cause his didn’t start so I am trapped in anyway. Shame – and I SO wanted to run errands…. Yes, I know, I am a huge wimp. Sort of. 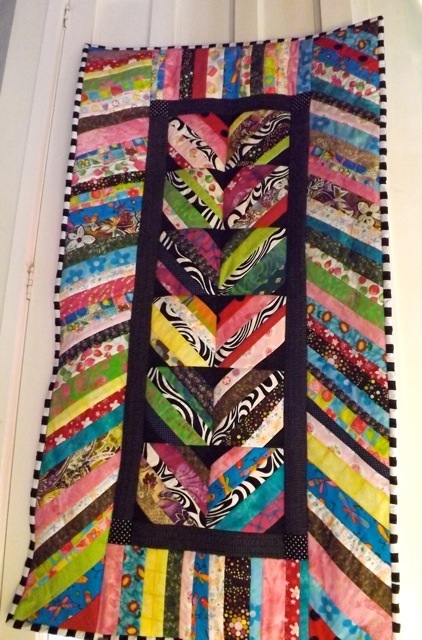 I had an idea to bring a little playfulness to my quilt by tying it in a different way. A couple of things to note. First, I started tying with yarn then decided I didn’t like it so I took it all out. DOH! The photos ar using the bright orange yarn so they show up really nicely, but they aren’t what the actual end quilt uses. I used a slightly less intense 6-strand floss, because I like the fray on the back. I hope you can see what I am talking about in the photos! I started with a long strand with the yarn, but I would say maybe a yard for the floss. You can make the Xs any size you like, and on my first try I found that I was wildly irregular size-wise. After doing it for a while I found I became more consistent. Also I am “tying” it with the quilt spray-basted and in a hoop. I prefer working in my lap rather than hunched over on the floor. 1. 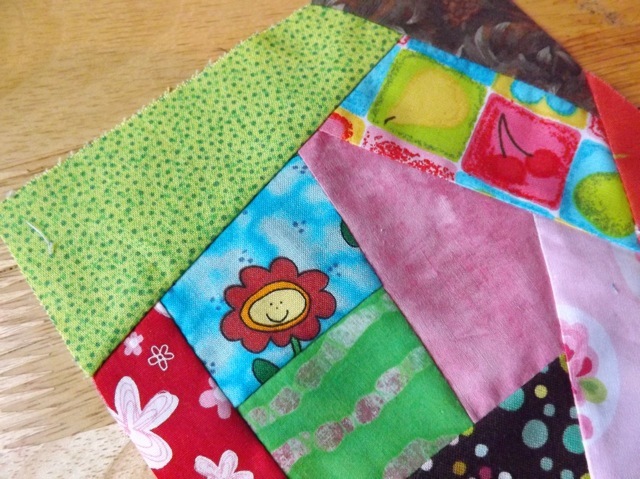 Come up from the underside of your quilt – leave a 3″ tail. Go down into the QUILT TOP and THE BATTING (wadding for my UK friends) but not thru the bottom. Slip the needle across between the batting and the backing and pop the needle up, in line with the spot where the needle came up from the back. I experimented with a sort of template to see if I could get my Xs a consistent size, but it ended up being a little to big. But I think you can see what I mean. 2. Bring the needle up to complete the X. ANGLE the needle back thru all three layers so when it comes out thru the backing it ends up CLOSER to the original hole. The keep you from being to far away to tie neatly. See how it is closer than the area of the X? Now, you can carry on to make the next X, leaving a loop of yarn/thread at the back – doing in a hoop I just catch the yarn on my finger under the hoop, and make sure when I come up for the next X there is some slack. Snip the loops and tie with a square knot. I’ll take a shot once I get the centre done with the new tying thread so you can see how it looks. But I think you get the idea. My goal was to bring a bit of playfulness to the quilt, which is made from not overtly childish fabric, so if the Xs are not PERFECT they will make it so. But my aim is for them to be FAIRLY consistent. 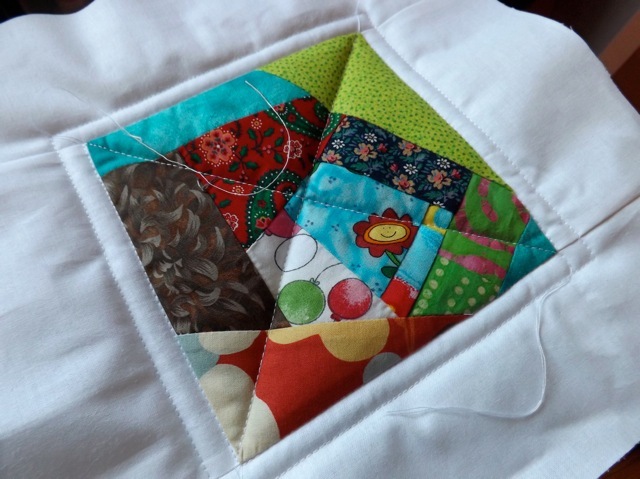 One point to note: you need to keep the quilt oriented the SAME WAY – so don’t twist and turn it while you work – keep the top at the top at all times. That will make all your Xs crossing the same way – and I found mine were slightly skewed wider across than top to bottom, no matter how hard I tried to match them if I rotated the hoop. You may not care, or you may be a MUCH more precise hand-stitcher than I am, but be aware. From what I did (before I took it all out) I really like the look of it – it IS playful and the orange (even the toned-down floss orange) highlights the orange in the fabrics and the Xs are just cute as can be. Plus with the extra stitching, the thread is “caught” more so even if some nimble fingered kiddie were able to pick apart the know they would struggle to get the thread out! A bonus, in my mind. At the moment, because I don’t have a ton of this floss colour, (thank goodness the colours are standardized!) I am making an X, snipping and tying, then doing the next X – it’s a little bit less wasteful, and because I can sit comfortably while I am doing it I don’t mind going slow. But I swear, I don’t think I have actually SEEN an episode of Eastenders in yonks. I’ve HEARD them all, while my eye is focused on whatever I am doing, so I haven’t lost the plot yet, but I almost forge what the characters look like LOL! Anyway, that is what I am dong at the moment. Hope you find it interesting. Hi there WOYWWers! I was totally MIA yesterday as I was hunkered down on my floor struggling with another small quilt. I had 4 fat quarters, and some off cuts from an old project that went, a bit, and got it in to my head that I could make something of it. I started by sewing the four quarters together. The bright yellow is a metre of fabric that I thought would work for the back. I cut a 12.5 square right out of the middle. Then sliced off the intersections and squared off the remaining bits. That gave me some 6.5 inch squares, each with two fabrics. And a pile of plain squares too. This is where I am. It’ll get a border of the dark green and then I’ll see where I am. It will certainly work out to be more lap-size (I’m thinking about 44 x 30ish maybe?) 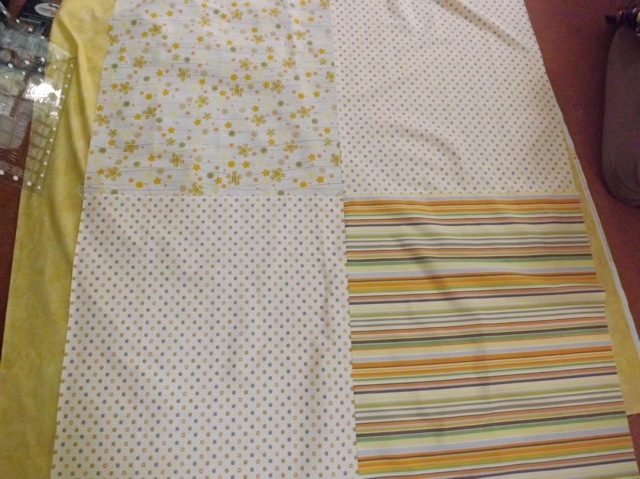 than even a cot sized quilt, but it’s not bad for such a minimal amount of fabric (and so far what’s leftover is laughable – almost NOTHING) and starting with no pattern or cutting guide at all. Now I have to decide if I wimp out and tie it or if I have a bash at stippling it. I think I need a lesson from a real person, as YouTube is good but it’s not really enough! Maybe I’ll do a practice square and see how I get on. But not till I desk hop 🙂 Happy WOYWW! Categories: fabric, quilting, WOYWW | Tags: sewing, WOYWW | Permalink. I’ve basically had this done, with the exception of the blog-strip, and although there is one thing I want to add, I figured I might as well share it. Those photos of DS on TwitchTV are pretty dark, certainly in this shot, so I may end up tweaking them to lighten them and re-print. What are you seeing? Weather stats for February, DD doing her Gelli plate play, a spur of the moment just-off-the-bus thing, what I’m watching and reading, what is compelling me on You Tube, a shot of my LillyBo quilt in progress, DD and her little puppet (for a performing arts thing at school) and a funny story about how she interacts with it, and the previously mentioned TwitchTV screen capture. 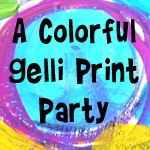 What I like about using my OWN printables is I can easily tweak them – I changed the size as well as some of the words. 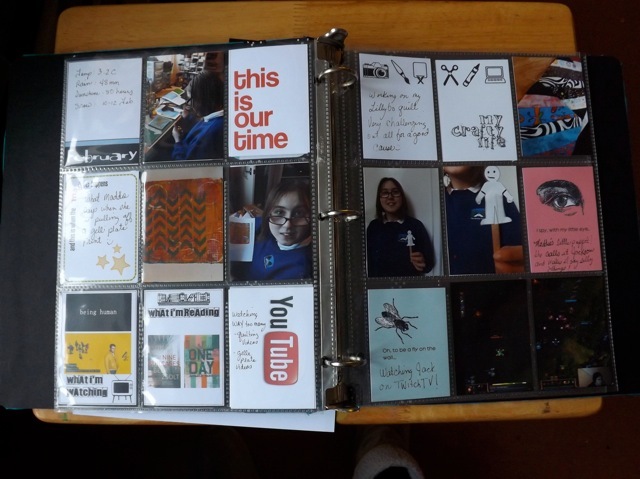 I also did my what did I blog strips, and took the month strip from the month-cards and re-sized it to fit. What I want to add is a strip to back this sheet with a list of blogs I visited. Cause I know even if I bookmark them I will forget. Right now I need to tidy up all the fabric scraps that are ALL over the floor. And I am hot on the trail of an idea, but time is short. As ever…. 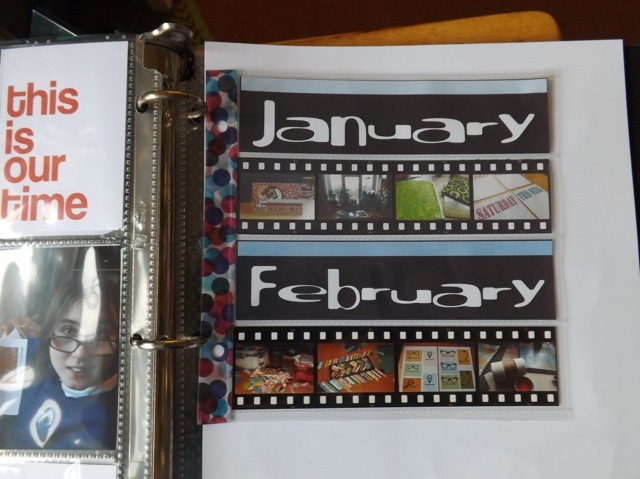 Categories: Project Life, scrap related | Tags: Project Life, scrapbooking | Permalink. It’s a bit of a hodge podge, in the sense that the striped top was built on light weight polar fleece, so sort of “quilted”, just by the nature of the sew&flip stripes – the border stripes are quilted with just straight lines. 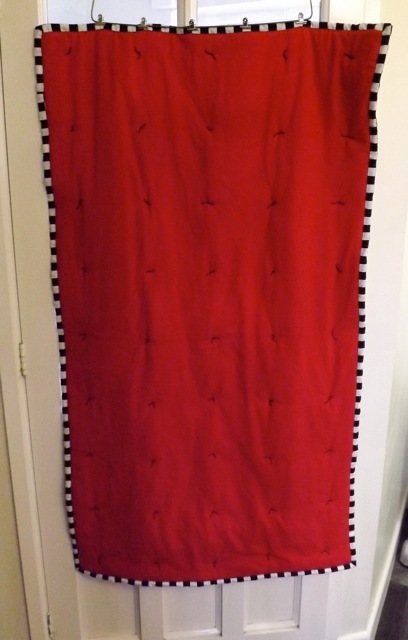 I had seen a tutorial for Quilt-as-you-go that does it like this, QAYG for the top, then adding the back after the fact. I didn’t follow it exactly, but the general principles are the same. 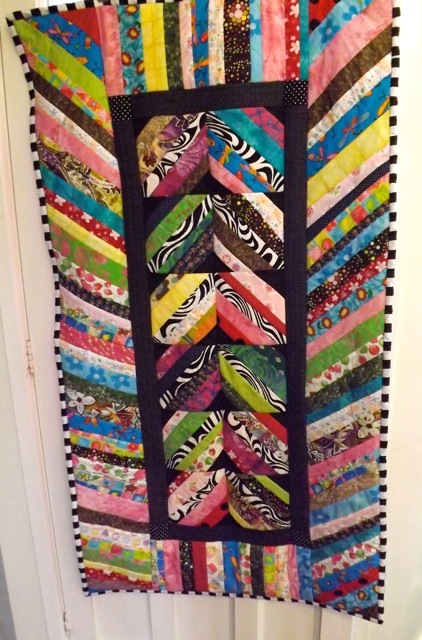 I went with a tied quilt to join the front, another thin layer of batting, and the back. I’m sure “real” quilters will shudder at the higglety pigglety assembly, but its warm and cuddly and looks good to me. Now, about that border. I love the look of the alternating B&W squares, but there was simply no way I was going to try to piece it. I thought to myself if I found a checkerboard fabric that had blocks of the right size, I could fake it. I went looking for guidance and did lots of Googling, but found nothing. Images that came up didn’t SEEM to address what I wanted (and I got bored looking thru all the links that ended up being not related) and the site searches didn’t seem to be what I wanted either. If you read this and know of a tutorial for this kind of thing PLEASE share it with me! I would love to see how a pro does it. Here is what I did – I hope I can explain it in text, as I didn’t take photos along the way. I’ll point out the issues as I go. I joined the strips, not like bias binding, but straight across, matching the block very carefully (pinning well) and sewing slowly right along the matched edges. Open and press the seams really well. Honestly, the join in the PATTERN was imperceptible, and only by feeling could you notice the difference in the thickness where the seam was. Press the entire length in half, wrong sides together, right along the edge of a row of blocks. 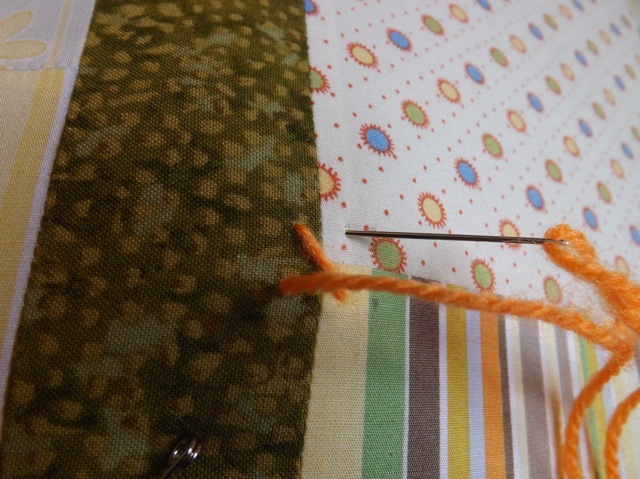 Trim the entire length with a 1/4 seam allowance along the raw edge side. Looking at the strip you should have folded edge, a row of B W B W then a half row of W B W B, raw edges. 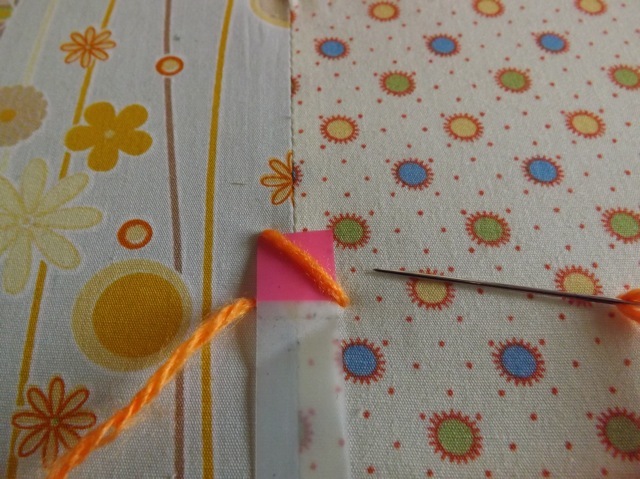 This is the tutorial for sewing on the binding. If I had tried to mitre the ends to finish off the checkerboard would have been impossible (well for ME anyway) to match. Overlapping the ends gave me a better chance of having it look OK, if not perfect. 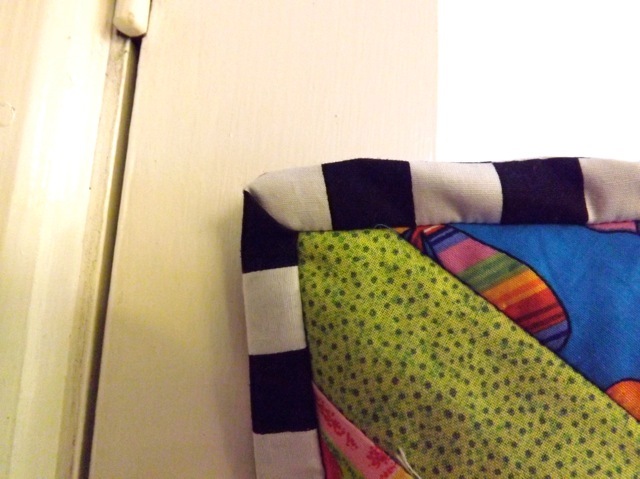 When you sew the binding to the front of the quilt, pin generously and sew right along the edge of the half block row. Obviously this SHOULD be a 1/4 inch as you’ve trimmed it this way. 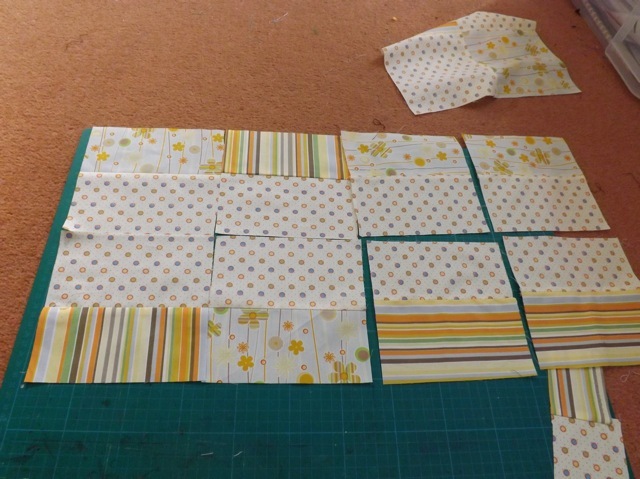 If you are sewing along and waver a bit and need to make a decision between following the 1/4 inch measurement or following the edge of the blocks, follow the blocks. GO SLOW. Do the usual flip at the corner, as per the tutorial. 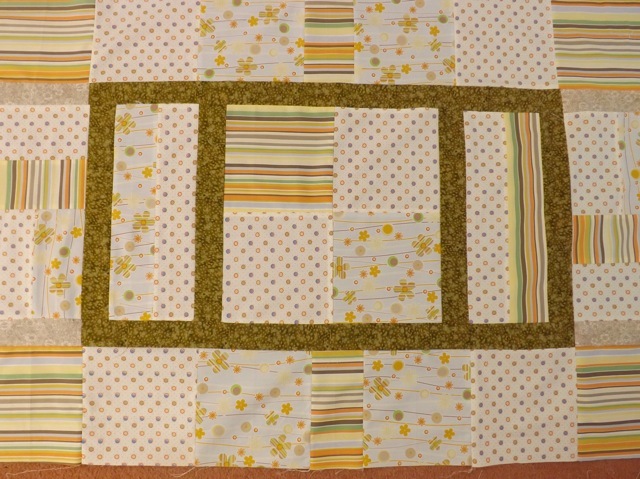 Now, I thought the corners would be an issue, but whether it was just dumb luck, or something to do with the spacing of the blocks, all 4 corners actually worked out OK. You can fudge them a tiny bit if need be – I think we are talking maybe 1/4 inch at the most. Each corner of my rectangle was different. The ideal is the half black/half white corner. I managed to get this one bang on! I have two that have a solid block in the corner, one black, one white. No so well done with the mitre but again, I can live with it. 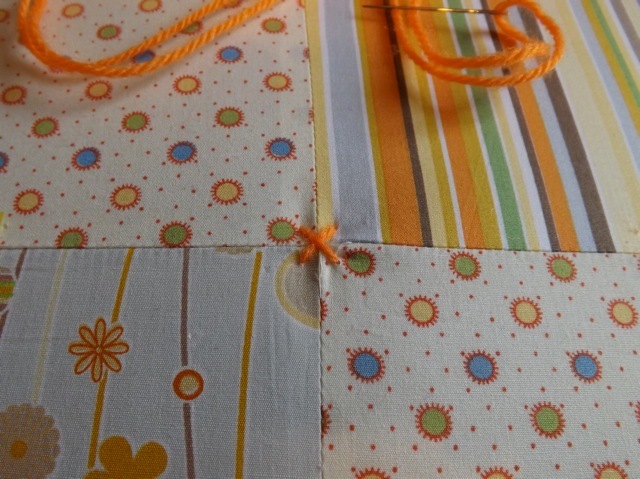 When flipping and sewing to the back, I made sure that the fold hit the line between the blocks, so the binding is one row front, one row back. The join at the end was ALWAYS going to be a risk – no dumb luck this time! I intentionally started the stitching fairly close to the corner so I could disguise this by applique – I thought maybe an arrow, front round to back, pointing to the label. It’s not PERFECT, but it’s not horrible either. And I think it’s a reasonable trade-off for how stinkin’ cute the checkerboard looks. 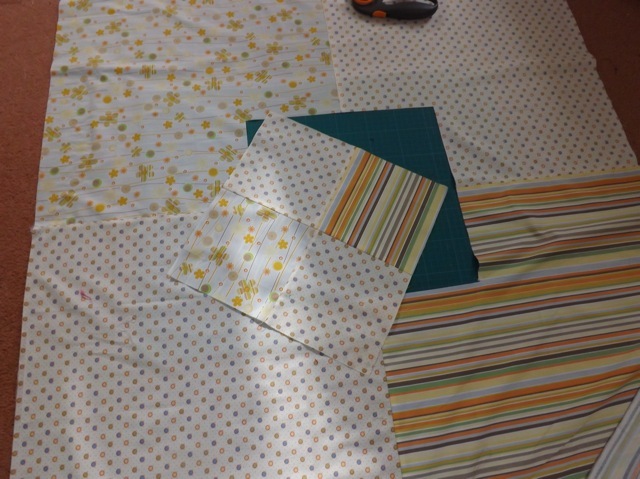 I think I would try again, maybe attempting more quilt math to see if I can get the join more perfect. 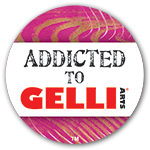 So sorry to bore all the papercraft people, and the PL printable people, and the Gelli play people with all this sewing malarky. I started a discussion on UKS about motifs you are sick of seeing. Mixed response (some people love butterflies, some are heartily sick of them being plunked down everywhere!) but interesting that a few people mentioned the same things that are appealing to them at the moment. 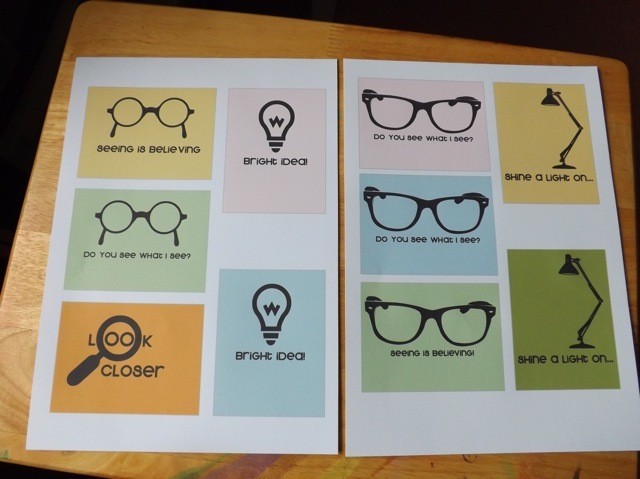 Based on a post a couple of weeks back about designing your own stamps, I had created a sheet of images that I wanted to have made in to stamps – a few of the motifs turned up on the list in the discussion – glasses and lamps and lightbulbs. Funny to me how it happens that a lot of people key in on a motif seemingly at the same time. Anyway, I figured I’d have a bash at a printable set. Now the lamps I’ve seen seem to be of the fluted shade variety. As a Mac person, I prefer the Luxo Jr. style lamp (we even still have a working anglepoise iMac in da house) so that is what I used. For glasses, I prefer the old 50 style horn rimmed glasses to the Harry Potter style round ones, but I’ve done both. I was looking for a good cat’s eye glasses motif but so far am not finding exactly what I want. That may come. I’ve gone for pretty pale backgrounds in a mix of boy/girl/generic colours. Not every one is in every colour (or indeed in every orientation and only 3 x 4 size) but hopefully they are useful to someone! I still have my quilt binding to do, and even before I started sewing it on I’ve identified a potential problem with the join (which will be obvious once you see what I have in mind) but luckily I’ve also identified a possible solution that I think is going to work quite well if I need to do it. We shall see – it could all go horribly wrong still! But if it works I think I am going like it a lot. So I haven’t cut the printables to photograph them, but I think you get the idea! Have fun with them. Comment if you fancy a brighter set and I may do one! 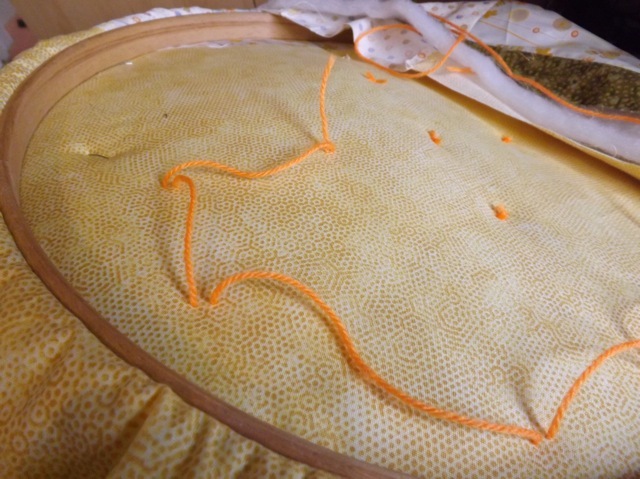 Jumping back to quilting – something from nothing? After I completed the quilt top (maybe I’ll be able to show the completed quilt tomorrow!) 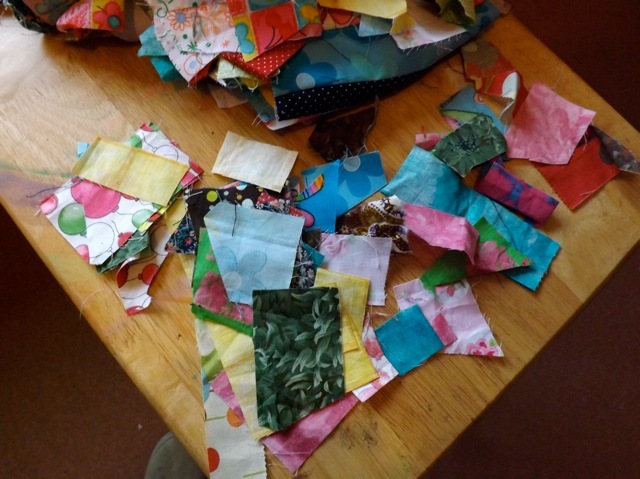 I sat looking at my depressingly large, yet colourful and bright, pile of scraps. I did SAY my life was over run with scraps of all kinds, didn’t I? Here’s the proof! 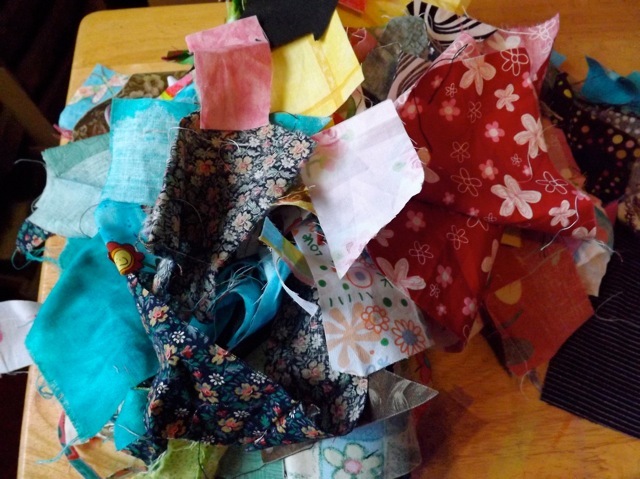 It is possibly hard to tell, but lots of those scraps are actually pretty darn small. That is 10 (yes TEN) 6×6 squares, just from the leavings. 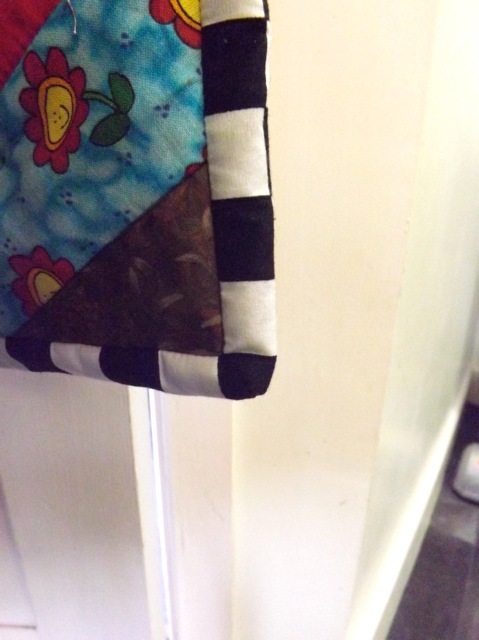 You can see the inner area uses the smallest of scraps, with the outer area uses more the longer strips. 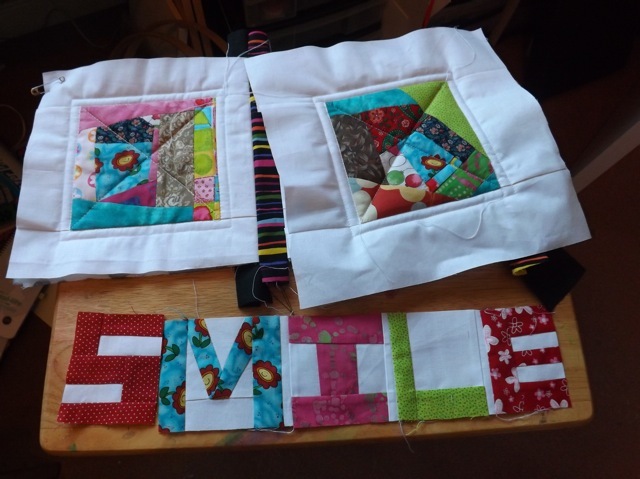 I tried not the think too hard about the placement although I aimed not to use too many of the more vintage/country-style prints in any block, and every block began with a 2×2 square of the smiley flower fabric. Where possible I tried to make sure at least ONE of the flower faces ended up on show in the final block, even if it didn’t end up in the centre. 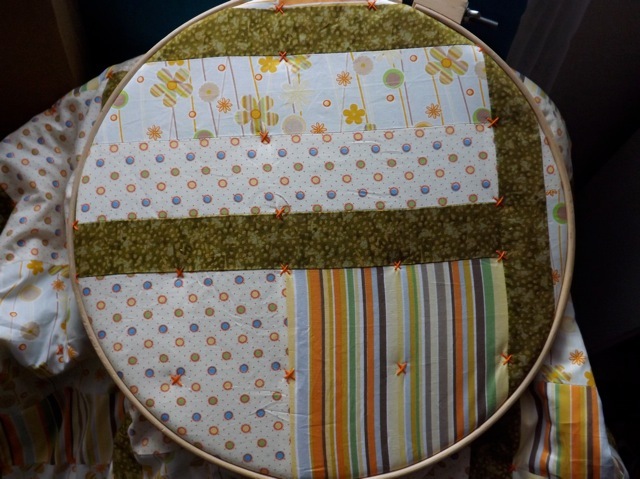 The blocks grow somewhat organically, as you add crumbs and strips, sewing off at angles and along straight edges. Here are a couple alone. and here you can see the cheerful little flower face. I worked on five blocks at a time, adding the first few rounds to each square, one after another, in a chain. I cut the chain thread, trimmed the excess from the seam (creating yet MORE crumbs) pressed them, then added another edge. Once they got to a reasonable size, I could lay the 6 x 6 template over it to check the placement and see if I only needed say one strip to finish it off or if, in fact, the block was done. So that is a total SCORE! from my POV. 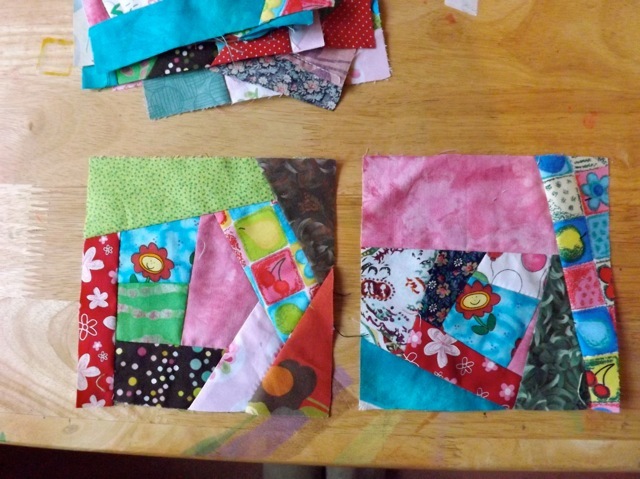 If I get one quilt from the big scraps and cut-into fat quarters, then a whole other quilt from the crumbs, with maybe a small amount of whole-fabric added for the sashing, it will be outstanding. 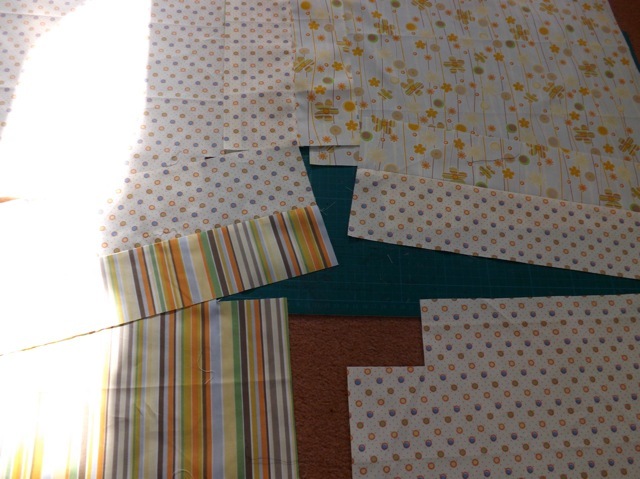 I am undecided if the new book I got will help me overcome my limited skills and do the word play border for the crumb one without having to buy material – cause I already had to buy backing flannel and fabric that I hope is going to end up a totally cool border for the striped one. Now, this weekend is all about DD – DH has other commitments so she and I will spend the weekend (except her Challengers outing time) doing girly things together. Have to miss crop AGAIN, but hey ho – she already has loads of plans for us. Read an article on Love Bombing in the Sunday times (link is not to that article but another one by the book author) last week or the week before, and really wondered if the concept would work with her, given her handicap and difficulties with language/understanding. So we’ll see how she does – I’m not planning on TELLING her she is in charge, which could lead to her asking to hop on a plane to Euro Disney, but I AM going to let her drive, and try very hard not to say NO to anything. It’ll be interesting – and a great start to my March PL pages. Reminder: must finish off February’s pages tomorrow while she is out!